I have been using Visual Studio Code more than the PowerShell ISE nowadays for script development, C# and a few other projects. I mostly focus on Microsoft integrations but have started doing a few more things with our Python Toolkit (Pure REST Client). So I decided to give the Python integration with Visual Studio Code a go and found that it’s damn cool! 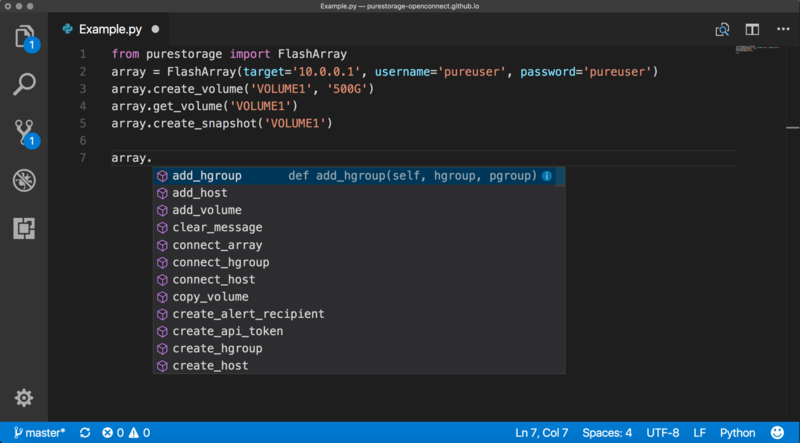 See the example below where I have imported the purestorage package and writing a very basic script you can see that once an object has been created (array) using FlashArray whenever referencing the array and using “.” you can see all of the different methods that can be used. Makes developing Python scripts a bit easier!